Chocolate and the art of mindful living. We hear the terms ‘mindfulness’ and ‘being present’ a lot in the world these days, and often in the world of yoga. These seem like new-age terms but they’re ancient concepts that have underpinned yoga philosophy since its inception. If you’re being PRESENT you’re doing YOGA. So, what do we mean when we talk about mindfulness and presence? And how might these things benefit us? Being mindful and present, in simplest terms, means being AWARE. It means bringing your full attention to any task you are undertaking – connecting with the movement and sensations involved in an action. It can be as simple as noticing the breath and how/where it moves in the body. Or watching your hand pick up an item and noticing what that item looks, feels and/or smells like. In the realm of my unconscious I’m usually admonishing myself with some obsessive and totally subjective criticism: ‘you’re a failure!’ or something similarly charming (usually in the voice of a Nurse Ratchett). This leads to an experience of emotional discomfort (usually anxiety), which in turn leads to a mindless chocolate binge during which I’m not even PRESENT enough to taste the chocolate (and I have lactose intolerance so I’ll leave it up to you to imagine what happens next). If I could be present with the initial thought I might be able to short circuit that entire unnecessary process – simply by observing it, being present with it, instead of scrabbling for relief. When we are living unconsciously (without mindfulness and presence) we can get caught up in things that cause us suffering – like regrets about the past, worries about the future, anticipating events that have not yet happened, fantasising about the kind of life we want, resenting things we don’t have, wishing we were something or somewhere else, indulging our insecurities, looking for ways to ease our discomfort and pain, choosing impulsive and often destructive ways to get ahead (like stepping on other people and giving ourselves avoidable runny bum). This way of being creates a constant state of tension and RESISTANCE towards life. We cannot FLOW with life. We never feel truly safe. PEACE OF MIND eludes us. We perpetuate a cycle of suffering. When we stop and simply be PRESENT, we become CONSCIOUS. We WAKE UP and begin to actually LIVE life. We respond IN the moment TO the moment, without judgement and neurosis. We simply notice what is and we make an attempt to allow it to BE. A mindless life passes in a flash and we wonder where it went. A mindful life is a life LIVED. It is a life RICH with experience. It is an appreciation for every moment. It allows us to suffer without avoidance. Each suffering is suffered once – not replayed and suffered and avenged a thousand more times in the imagination. And this is just the tip of the iceberg. Experiment with being present and observe if it transforms your life. I’m starting right now. After I eat this chocolate. 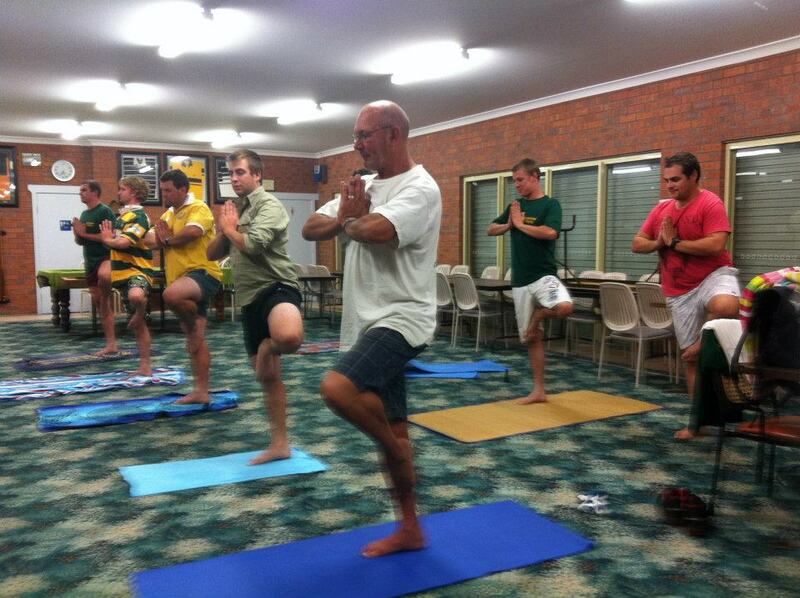 This week I had the pleasure of teaching yoga to a team of rugby union players. I wasn’t too sure how it would pan out. The coach hadn’t told the men that they’d be doing yoga at training (probably knowing many might not turn up if they knew!) so when they arrived to see l’il old me there with my mat and fisherman pants, I saw their faces drop one by one, like a line of dominos. I attempted to soothe their terror by requesting they take off their clothes for some tantric yoga and a discussion on chakras. Some nervous laughter and then we were off – not with our clothing but with our practice, starting with a musing on how yoga might be good for the game of football. Yoga is being increasingly used in the world of elite sports with many professional rugby union, league and AFL teams including yoga in their training programmes. Trainers are recognising the benefits of yoga, particularly for flexibility and injury prevention/management as well as for mental grounding. A football team is a veritable hot bed of injuries. It’s a high impact sport where the body and emotions are pushed to extremes. I had expected some resistance to the class. That was no surprise. Because yoga is so often ill-perceived in parts of society as ‘soft’ or ‘feminine’ or ‘weird’, especially by macho men. Admittedly, I did not bust out any OMS (this was not what I was there for). But what I didn’t expect was the unfolding of perhaps the most focussed group of students I have ever taught. These blokes, initially tentative, put their hearts and souls into every single asana instructed to them. They tried harder than any other group of students I’ve seen. It was as if they were not prepared to settle for anything less than their best. Competitiveness is discouraged in yoga because it’s perceived as a reaction of the ego as well as a risk leading to unsafe practice (work within your limitations, no strain!) but every character trait or quality is a two-sided coin. In this case, this innate competitiveness yielded a special kind of discipline – a tenacity I’ve not encountered in a general class. It was deeply admirable. And discipline (abhyasa) is a central tenet of yoga – one cannot progress without discipline. And it’s something I lack. I’ve never been into competitive sports. I’ve never had the drive. I’d rather put my hands up in the air, surrender and let the other person win. Winning doesn’t seem that important to me. But when I think about it, this disinterest in competing (even with myself) is more about self-defeat than it is about surrender. This is more about my inability to lose than it is about a gracious letting go. If you don’t try, you can’t lose. Yoga tests our self-image simply by being challenging. How we react to a challenge reveals much to us about ourselves. What these guys had that I do not is faith – faith that if they try, they will achieve. No doubt. Giving up is not in their vocabulary. That’s not to say that this is the perfect state of being – being able to give up (detach) lessens our attachment to suffering and the desires of the ego and I’m sure there were some frustrations in the room and some unnecessarily sore muscles the following day. But I’d rather that tenacious part of my ego was activated, than the part that gives up before it tries. I know it’s not about my gratification but I walked out at the end of that session basking in a big inner glow even though at the time, I didn’t really know why. It took me a few days of thinking about it. These blokes knew nothing about yoga, or what they thought they knew pushed them way out of their comfort zones. But they had a royal go, they put everything in. I had walked into that class with the idea that I might be able to give them something. But they ended up giving something to me.